Llanwinio is a parish in the Hundred of Derllys in the county of Carmarthen. The surrounding land is cultivated and mainly pasture land. In 1844 its population was 1035, chiefly employed in agriculture and the raising of sheep. By the time of the 2001 Census, the population had declined to only 432. The parish church, dedicated to St. Gwynno, had been completely rebuilt around 1844, and little is known about the previous building It’s not obvious from the photos, but the burial ground surrounding the church is circular. Llanwinio is remarkable as it is one of the few remaining circular burial grounds in Britain, dating back to Celtic times. The Celts believed that the circle gave immortality to those buried within. The burial ground is raised up above ground level in order to keep the dead dry. Although now relatively isolated, Llanwinio was probably on the main highway between Ireland and England in the sixth century. 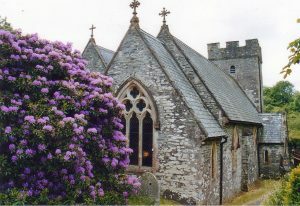 St. Gwynio also founded a chapel at Cilsant some four miles away (the name means Saint’s Retreat) and would walk from here along a footpath to the church at Llanwinio. He was attacked by Irish marauders on this path and decapitated. A spring sprung from the ground where his head fell, probably at Ffynnon Felyn. His Saint’s day is the 2nd of May and in 1994 a pilgrimage was held to retrace his steps from Cilsant to Llanwinio Church.